Yesterday was National Doughnut Day in America and the doughnut is as American as apple pie. The doughnut is said to have originated here in the U.S. back in the early 1800’s where it appeared in an English recipe book. Krispy Kreme, Dunkin’ Donuts, Tim Hortons and LaMar’s Donuts all gave away free doughnuts to customers to celebrate the big day. But there is another type of donut that has also been around as long as the automobile. The Chevrolet Camaro team driving a 2013 Camaro ZL1 made some of their own donuts using an extreme recipe. 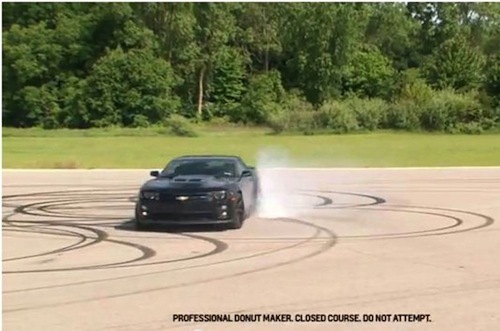 They took a 580 horsepower supercharged ZL1 Coupe and turned out some quick donuts yesterday. The Chevrolet Camaro team made four donuts in a secure parking lot in a matter of seconds to celebrate the day. The 2013 Chevrolet Camaro ZL1 comes well equipped to make donuts. At the heart of the recipe is a supercharged 6.2-liter supercharged LSA engine, pumping out 580 horsepower and 556 lb ft of donut making torque. That makes the ZL1 the fastest, most capable donut-making Camaro ever. The video below shows the Chevrolet Camaro team celebrating the day in a big way. Other than its donut making abilities, it also has a few other recipes it can make. Its other performance recipes include, 0-60 mph sprint times in just 3.9 seconds. The ZL1 has a top speed of 184 mph, it can achieve sub 12-second quarter-mile ETs (11.93 with the automatic /11.96 with the manual transmission), and has lapped the Nurburgring in 7:41.27. The video below shows a 2012 Camaro ZL1 taking on the closed course at 112 mph and scorching the race track. Would you like smoke with your donuts? ZL1 offers two 20-inch wheel options to smoke the pavement with donuts. Both have 20”x10” front and 20”x11” rear sizes, and are forged aluminum, optimized for high strength and low mass. The team chose the standard black 10-spoke wheel to make the special donuts. We just wonder if there was any rubber left on those tires to drive back to the shop. The 2013 Chevrolet Camaro ZL1 is the kind of vehicle that engineers dream about designing and donut-making car nuts dream about driving. There is a disclaimer on the video that says, “professional donut maker, closed course, do not attempt this at home.” Happy National Donut Day. It makes us want to go out and celebrate with a few donuts of our own. Watch 2012 Camaro ZL1 laps Nürburgring in 7:41:27 video.